We have a wonderful collection of Marcia Derse bold and beautiful cottons back on stock. Fabrics from her Gerta, Stream Line, Lines collection. Marcia is an U.S. silk screen artist who specializes in both primitive, modern, urban fabric with a hand dyed look. She works closely with the textile manufacturers in Japan to make sure they maintain the original art of her work. Her fabric makes up not only into wonderful quilts, but dynamic bags, totes and even furniture! 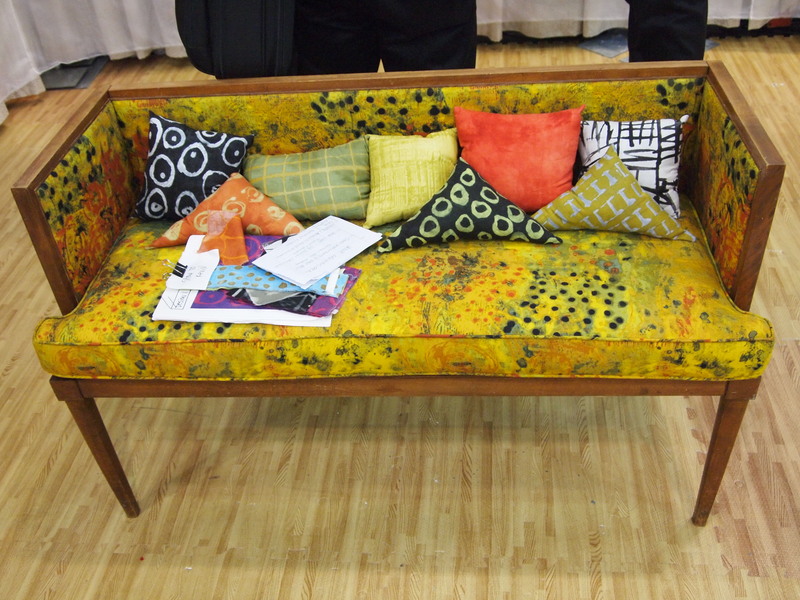 Just look at this sofa made up in Spotted Graffiti, and those pillows of Citrus, Ink Black Bullseye and Moss Brushstrokes. We’ve made up numerous versions of this bag, Carmel, by Quilter’s Connection with Marcia’s fabrics as well. The latest rendition will be for sale at the Creativ Festival in Toronto, Oct 26. Come see us in Booth 710! We’ll also have die cut charm packs and jelly rolls, half metre and full metre cuts. This entry was posted in Fabric and tagged bold cottons, fabric, Marcia Derse, modern cottons, quilting cottons. Bookmark the permalink. The colours and the patterns is really beautiful! I also like all the inspiration…. Dresses, bags, quilts, etc. Do you have any more of this Derse collection?